Diwali – The festival of lights…. 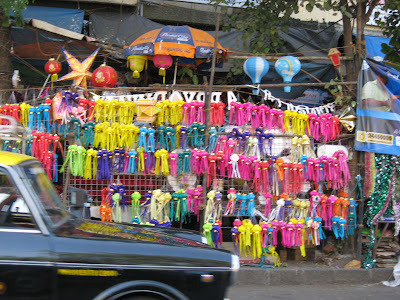 Everything associated with this festival, celebrated in every nook and corner of this vast land of ours, is related to light and gaiety - new clothes, rows of oil lamps and candles (now replaced by serial lights) lighting up the house, whether a mansion or a hut, and of course, the fire crackers! One of my most cherished memories of Diwali is the one I spent at Varanasi in 1989. Once our ritual oil bath early in the morning was done, we made our way to the Annapoorna Temple to have darshan of the golden image of the goddess which is taken out only that one day every year. We spent more than half the day in the queue at the temple, and were rewarded with a glance at the beautiful trinity of goddesses – Annapoorna in the centre, flanked by Bhoomi Devi and Sri Devi, all made of gold; and the tall image of Lord Shiva, made in silver, accepting Bhiksha (alms) from the goddess. Though we had but momentary darshan of this wonderful tableau, it is fresh in memory as if it were yesterday. This year, we found ourselves unable to celebrate this great festival due to the sad demise of a relative. Diwali without light and celebrations is a gloomy prospect, and, trying to find a way out of it, we decided to use this opportunity to travel to Rameshwaram to complete our Kashi Yatra. 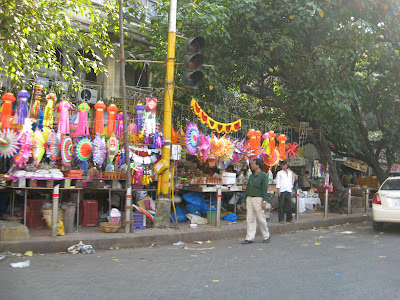 (For more details about my Kashi Yatra, see my blog: http://kashiyatra.blogspot.com/). What started out as a trip to my sister in-law’s place at Tiruppur and then the trip to Rameshwaram, soon blossomed into a full fledged tour of temples in and around Thanjavur, Kumbakonam and. Thiruvarur. My mother – in – law is a veritable encyclopedia of temples all over India, and all of us love visiting them. While she retains all the details of temples in her memory, I have to rely on pencil and paper, and this time, the computer. This was to be a family trip, consisting of my in- laws, me, my husband and Samhith, and my sister – in – law, Sandhya, and her husband Sankar. While this was to be my first visit to this area, all of them had visited some of the temples earlier. Every one had their own idea of which temples to visit and which to skip. This area is veritably filled with temples, almost every village boasting of at least one Shiva or Vishnu Temple. Every temple has a story of its own, is huge, and has some thing worth talking about. It is said that it is virtually impossible to visit all the temples here in one birth. 10 days certainly wouldn’t be enough for all the temples we wanted to visit. After much searching on the net and with my mother – in –law’s help I made a long list of all the temples we wanted to visit, and finally decided that we would visit only the most important ones on the list preferably those which none of us had seen. We started from Bombay on the 24th of October, taking a bus to Bangalore, as no tickets were available on any train, and flights are just too expensive these days. We booked the bus tickets through KSRTC, who have opened up their online booking portal to individuals. There were a couple of inconveniences though – the contact number given was no longer valid, we had to board the bus at Sion instead of Chembur, which would have been nearer for us, and finally, the bus was late. We reached early, and found ourselves with more than 2 hours of waiting ahead. 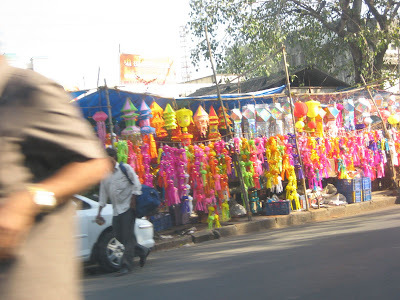 Standing at Sion for two hours seemed impossible, and we took a cab to Siddhivinayak temple. The temple seemed almost deserted, for a change, and we had a wonderful darshan of the Lord. We thus started our temple tour with darshan of the elephant – headed God who steers us clear of difficulties. To me, it seemed a good omen to begin our trip on this note. Finding myself with a camera while traveling in Bombay, I clicked photos incessantly of the kandeel-vendors selling their wares. I love these colourful lamp shades, and missed buying them, as I would have had I been here for Diwali. The bus, when it finally arrived at around 6PM, was extremely comfortable, and the night sped by quickly. The morning, however, proved to be difficult, for the bus was late once more, and we reached Bangalore only around 3PM. But that was not the end. We had to go to a cousin’s house at Marthahalli on the road to Whitefield, which took us another one and a half hours. We only had time to grab lunch and take a short nap before it was time to take our bus to Tiruppur. We had booked this one online through Red Bus and had never heard of the company running the bus. It turned out to be a sleeper bus run as a special for the Diwali season rush. The bus looked like it hadn’t been cleaned in years, and it was unwillingly that we got into it. Surprisingly, we did manage to get some sleep, and woke up only when it was morning. We wanted to alight at the point nearest to Tiruppur, but the driver was a novice who had no idea of the place (looked like he had been hired simply because he could drive, and wasn’t one of the regular drivers) and he dropped us off about 50 Kms from Tiruppur. 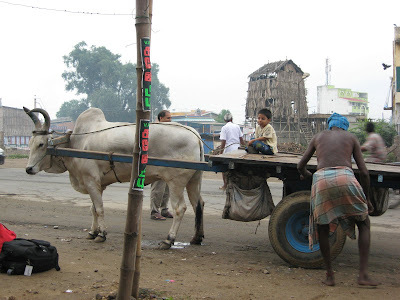 We had to wait till Sandhya sent someone to pick us up.Samhith spent the time sitting on a bullock cart, half enjoying it, and half afraid of the bull running away with him in the cart!!! We finally reached her house around 11AM, much later than the time we had planned to leave for Rameshwaram. We finally began our long journey to Rameshwaram after lunch, three hours later than planned. The delay led to our giving a skip to the beautiful temple at Madurai, and rushing off directly to Rameshwaram. Along the way we saw some beautiful such as a temple on top of a hill. We were in too much of a hurry to find out which temple it was, but it is surely worth a visit. 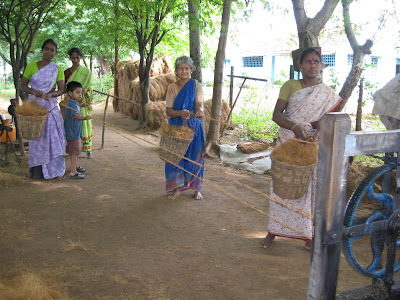 While we were waiting at one of the many railway crossings, we happened to notice a group of women weaving coconut fibre into ropes. I have, of course seen this before, but this time we had lots of time, and Samhith loved the sight. The women were delighted to have their photos taken, and they happily let us try it out. Time thus passed by swiftly, and we reached Rameswaram in time for bed, having had dinner along the way at Ramanathapuram. We spent Diwali morning at Rameshwaram, and moved to our home town at Nainar Kovil after lunch. We then drove straight to Thanjavur to spend the night. We began our grand tour of temples the next morning, spending the nights at Kumbakonam, Mayiladudurai (Maayavaram), Thirunallar and Thiruvarur. By then, it was time for my husband and my brother – in – law to get back to work. 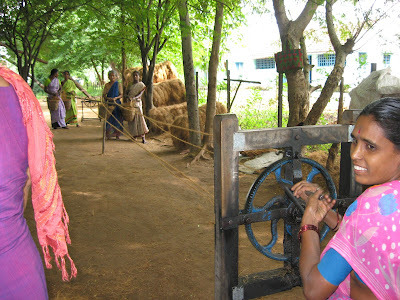 We thus traveled to Trichy where we parted ways, me, Samhith and my mother – in – law going back to Thanjavur to cover the temples we hadn’t visited, the others getting back to work. We spent a day at Thanjavur and another at Kumbakonam, visiting more temples, and finally returning to Tiruppur on the 4th of November. We spent 3 days at Tiruppur, Samhith enjoying himself at his aunt’s house, before taking the train back to Bombay. Thanks for sharing such wonderful pics of temples and your travelogues. 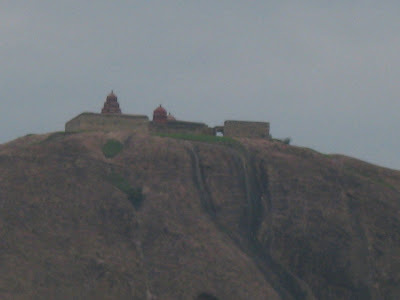 it is Uchi Pillayar Kovil aka Rockfort temple. I don't know the precise details , but the rock on which the temple is built is very very ancient.